M.C. Lilley & Co. color postcard. Image courtesy of the Columbus Metropolitan Library. M.C. Lilley & Company was another Columbus business that would benefit greatly as a manufacturer of ready-made uniforms after the war. By 1870, the company already occupied an entire four-story building on S. High Street, with a glass-fronted showroom and retail store on the first floor. This size of an operation positioned the company for tremendous growth and success in the coming "Golden Age of Fraternalism." During this period, from 1870-1910, over 20 percent of men in the United States belonged to a fraternal organization, which served various purposes such as mutual aid and insurance, political interests, social functions, and the comfort of stability and belonging in a dynamic post-war society that was rapidly industrializing. Clothing played a very important role in the ritual ceremonies for these societies, and M.C. Lilley & Co. capitalized on this influx of demand by manufacturing ritual costumes and attire. 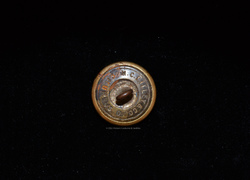 The most demanded and most comercially profitable form of military regalia, however, was the military-style uniform, which the company also produced for state militias, telegraph operators, and railway workers. 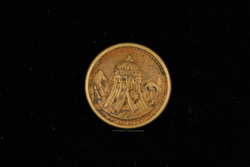 In addition to the clothing for fraternal societies, the company also produced metal decorations and fasteners to embellish the garments, such as buttons, buckles, studs, and grommets, along with custom-designed suitcases to hold and store elaborate and odd-shaped artifacts, like feathered hats, shoulder epaulets, capes, and gauntlets. This large-scale production of military regalia for fraternal organizations led to M.C. Lilley & Co. becoming one of the largest and most successful manufacturers in the world. In an 1882 story about Lilley's new building on Gay Street, the Evening Dispatch reported that more than two-thirds of the company's employees were engaged in producing clothing and regalia, inlcuding sewers, embroiderers, tailors, leatherworkers, and milliners. The 1887 Report of the State Inspector of Workshops and Factories listed The M.C. 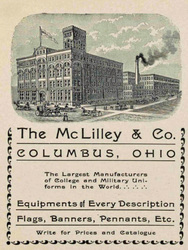 Lilley & Co. as the second largest employer in Columbus with 420 employees. Another report in J.A. 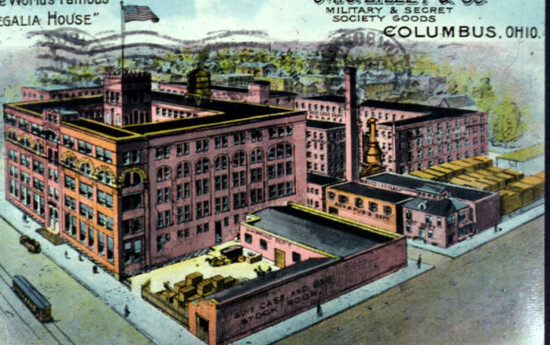 Miller & Company's, A Glimpse at Columbus and her Industries, published in 1890, stated that the "M.C. Lilley & Co. regalia manufactory" was considered to be one of five "mammoth" manufacturing operations in Columbus and one of "the five largest manufacturing companies in the world...exporting its uniforms and equipment for military and other organizations around the world." More information about M.C. Lilley, businesses in Columbus, and fraternal organizations and their uniforms can be found in Harriet Wain McBride's dissertation for her doctorate at Ohio State, Fraternal Regalia in America, 1865-1918: Dressing the Lodges; Clothing the Brotherhood. M.C. 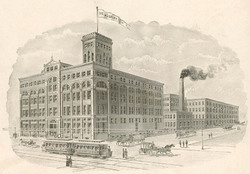 Lilley & Co. factory located at the intersection of Sixth and Long Streets, c.1892. Image courtesy of The Ohio State University Archives. M.C. 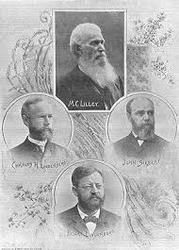 Lilley & Co. founders. 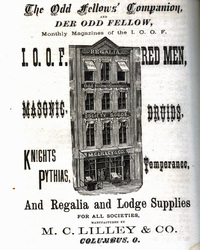 Image courtesy of The Masonic Chronicle, July 1890. M.C. Lilley advertisement for fraternal regalia. Image courtesy of the 1873 Columbus city directory. 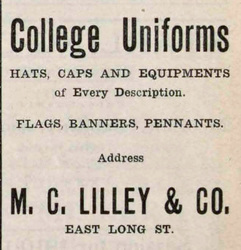 1901 advertisement for college and military uniforms. Image courtesy of The Ohio State University Archives. Advertisement for college uniforms from a 1910 Ohio State football program. Image courtesy of The Ohio State University Archives. 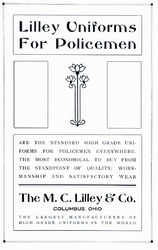 Advertisement for police uniforms manufactured by M.C. Lilley. Image courtesy of the History of the Police Department of Columbus, Ohio, 1908.